I have long felt that one of my weakest points is my ability (or lack there of) to render armor or metal convincingly. So with that in mind I have decided to commit my sketchbook work to the improvement of this shortcoming. Speaking of my sketchbook, some of you may have noticed the addition to the sidebar on the right where I have a couple items now for sale, including copies of my convention sketchbook. 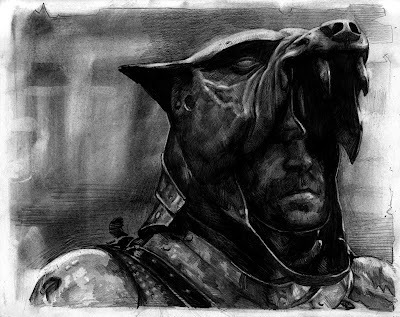 One of my favorite characters from the Game of Thrones series (the books not the tv show, he is a bit shorted there) is The Hound. So I decided to start with him. From a still from the show. Great drawing, Gist...and I'll put money on him being alive and at that abbey, by the by. So would that make the new king's guard The Mountain? In the words of T-Bone from Arrested Development; "Oh most definitely." 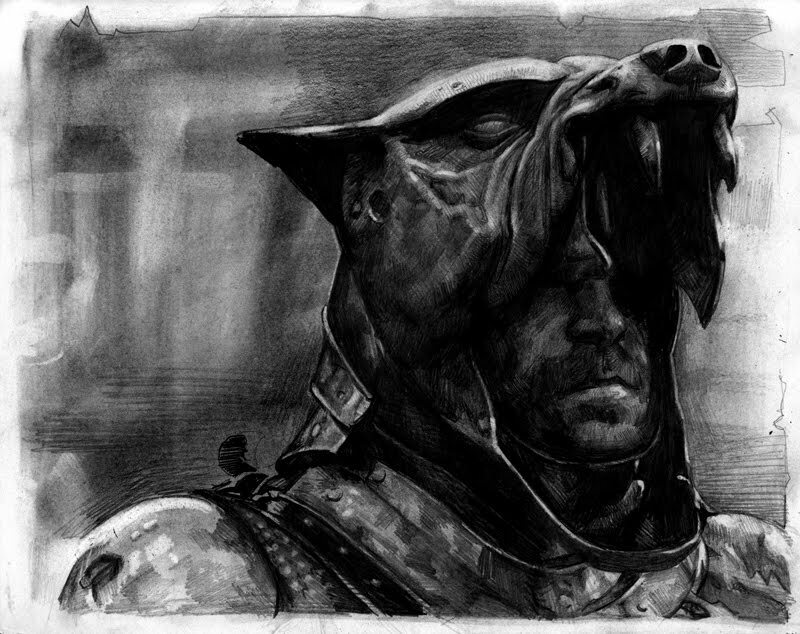 Awesome drawing Erik. I think TB means the abby that Brienne of Tarth visited in Feast of Crows. But ya i agree that the new Kingsguard was the reanimation of the Mountain. Lovely! I tried that charcoal technique only once (where you lay down the charcoal all over the page, then draw on it.) I completely forgot what it's called.